September is approaching, the #BackToSchool promotions are in full swing, students are getting their exam results and thinking about higher education. This is also the time teachers and lecturers are thinking about their lesson plans and learning strategies for the next academic year. Blended with traditional teaching is the use of advancing technology to support learning. Institutions are behaving more like brands, looking to spur innovation in the same way that businesses can, utilising entrepreneurial and startup practices to improve learning. Being ahead of the game in the field of edtech and elearning is one of the best ways to make yourself more attractive to prospective students and increase your reputation. This is why the industry has grown so rapidly from Q2 2014 to Q2 2015, investment was up 96% compared with the previous four quarters. A new report by New Media Consortium and the EDUCAUSE Learning Initiative gives a five-year prediction for emerging edtech. Key findings include advancing cultures of change and innovation, with institutions adapting to a culture that embraces innovation and allows for more flexibility, creativity, and entrepreneurial thinking. The report also suggests there will be a growing focus on data-driven learning, measurement and assessment, with better tools for teaching, more targeting of at-risk students and more detailed student profiles. Another future trend identified in the report is development within Open Educational Resources (OER), with more instructional materials available for free, and being open in terms of ownership and usage rights. Blended learning is another topic identified as a growth area, with students being given opportunities to learn in more flexible and alternative ways. Blended learning will provide easier delivery and access to learning materials, and provide alternatives to students who won’t be in the classroom every day. Classrooms will also evolve into spaces that encourage more collaborative interactions. Tools such as 3D printers, robotics, computers, laser cutting, and textiles will help contribute to these “makerspaces“. Many students are already bringing their laptops and tablets to school, the model of Bring your own device (BYOD) is set to continue. Another trend identified in the report is the idea of a flipped classroom, which refers to “a model of learning that rearranges how time is spent both in and out of class, to shift the ownership of learning from the educators to the students.” Podcasts, videos and online textbooks help facilitate this model. The incorporation of wearable technology in education is another area identified as a future trend; virtual reality devices are already being used to provide first-person perspectives in medical procedures, or to give virtual tours of campuses. Machine learning technologies can also be used as a tool that adapts to a student’s learning in real-time, providing personalized instruction and feedback. All of these tools will be synced to the web providing an “Internet of Things” (IoT) approach to learning, with teachers and students informed by crowdsourced, and location based information. We were very interested in seeing which edtech and elearning professionals and brands were leading the online discussion, so we analysed over 1.3M tweets matching the following query: “edtech OR #edtech OR elearning OR e-learning” and identified the top 100 most influential brands and individuals leading the discussion on Twitter. We discovered a very engaged community, with much discussion between individuals and brands, joining together in conversations looking to improve their quality of service. Below you can see a network map of the online conversation created with our Influencer Relationship Management software IRM. 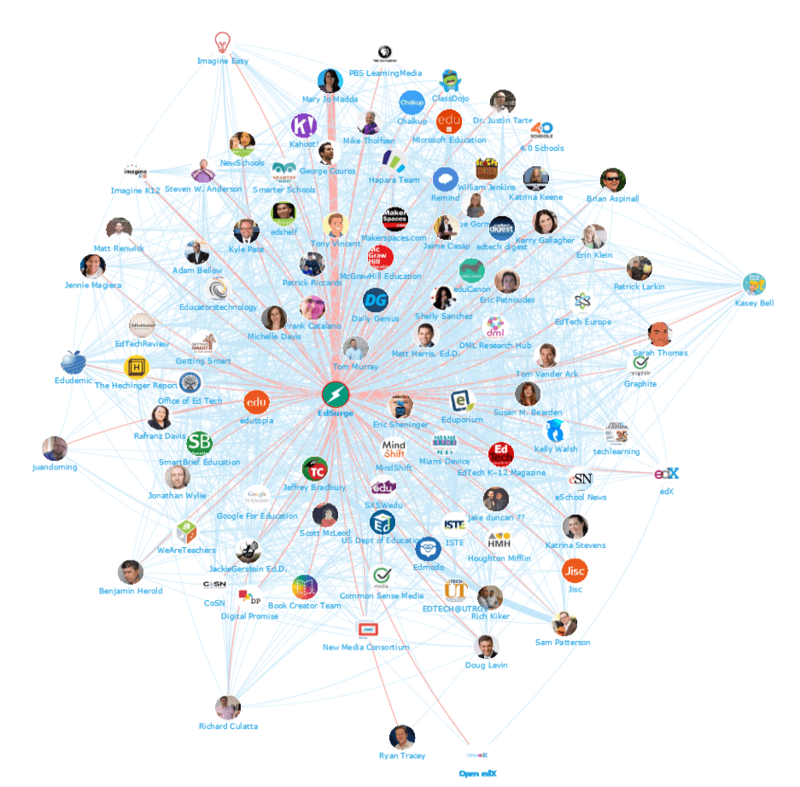 This map shows the number 1 brand Edsurge at the centre and the conversations to and from all the influencers. Be sure to click on the map to enjoy the full size network diagram in greater detail. 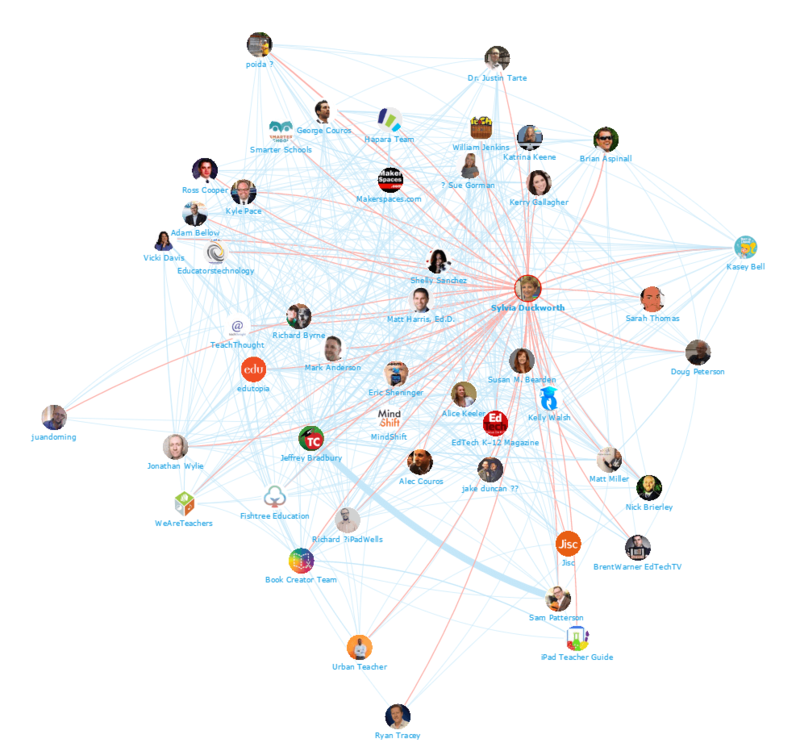 Below you can see another network map created in IRM showing the number 1 individual Silvia Duckworth at the centre, and the conversations to and from the different influencers. The thicker the lines the more engagements, as in the case of Jeffrey Bradbury and Sam Peterson. We looked at all the individuals engaging on Twitter to bring you a list of the top 100 most influential individuals in Edtech and Elearning. Be sure to hit the download now button below to download the full report. With all the discussion and resources available online, our analysis produced a great set of independent information resources and communities. 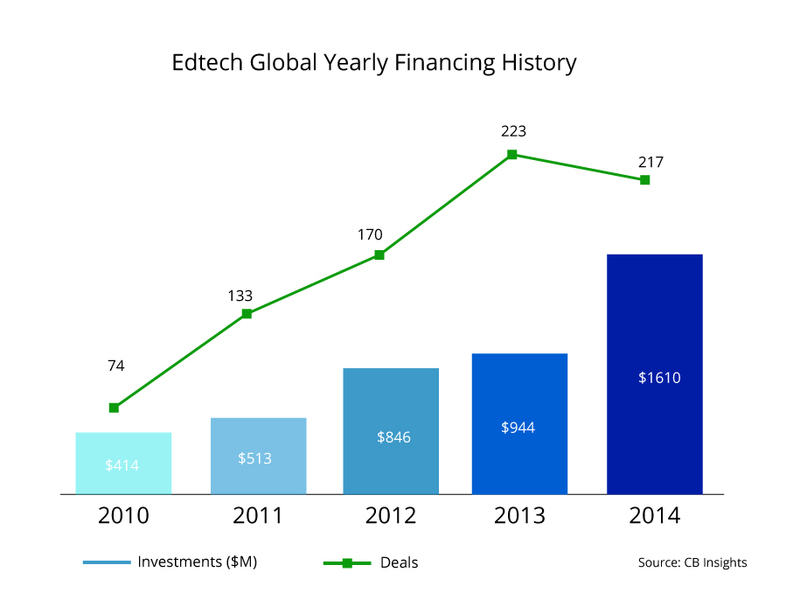 Influential brands such as Edsurge, Edtech K12, and publications such as elearning industry and Mindshift are leading the debate and publishing great articles, concepts and discussions about the latest in edtech software, and how learning is being impacted by technology. 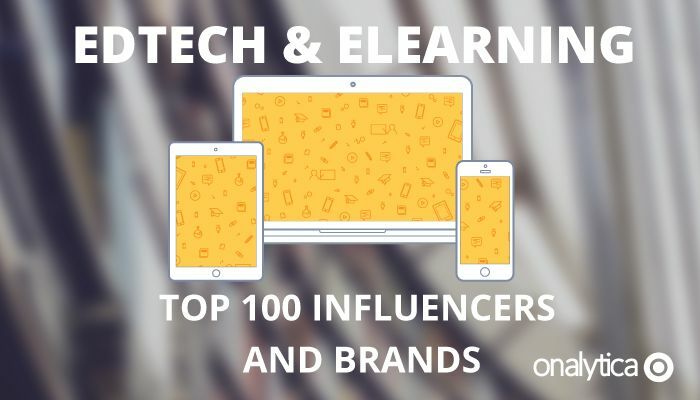 Be sure to download the full analysis for free to get an idea of who are most influential brands in Edtech and Elearning. REQUEST A FREE DEMODisclaimer: As ever with these lists, it must be stressed that the ranking is by no means a definitive measurement of influence, as there is no such thing. The brands and individuals listed are undoubtedly influential when it comes to driving discussion around edtech and elearning. The PageRank based methodology we use to extract influencers on a particular topic takes into account the number and quality of contextual references that a user receives. These calculations are independent of a user’s number of followers, but we do filter our lists based on how much a user is engaged in the conversation and the influence they drive through their networks.